These fun & miscellaneous videos have no category, but they’re sometimes about tractors, attachments and implements. There is on that discusses wisdom teeth, and you don’t want to miss Cooking with Mike. Most of the comedy is pretty lame, about a half step below something you’d see a toothless hillbilly do at an off-the-strip Branson comedy show. (The one you stumbled upon while shopping at a strip mall.) More creepy than funny, maybe? Still, I hold out the hope that some day one of these videos will go viral and I’ll be rich and reknown as a guest on the Jimmy Fallon show. 2018 Seasons Greetings from Tractor Mike and Family! The Rarest Tractor Ever Built? Baling Hay Looks Like Fun, Is It? Do We Really Need to Ride the Mower? How Do I Know if I'm Buying Good Hay? Is This the Solution to Mowing Slopes? The Best Tractor Ever Was an Oliver! Is Land a Bargain Investment Right Now? 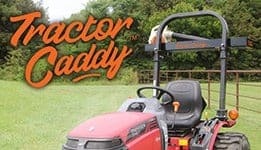 A Must Have For Tractor Owners!